While reading a PDF version of Sigma Pi Fraternity, International‘s Emerald magazine from October 1919 (Volume 6, Issue 3), I came across the brief article below, written by Harold K. Bowen. As a clarifying aside, Brother Bowen is listed as being from “Delta-Xi,” though that is not possible using the chapter designations that the Fraternity uses today since the Fraternity’s Delta-Xi Chapter was founded at Southern Utah University in 1970 and this article was published in 1919. My assumption is that Brother Bowen is from Xi Chapter at the University of Iowa (the Fraternity’s records show a Ralph Bowen initiated into Xi Chapter back in 1918) which was part of the Delta Province at the time. Today, the Fraternity uses geographic demarcations to name provinces (Heartland Province, New England Province, South Atlantic Province, etc. 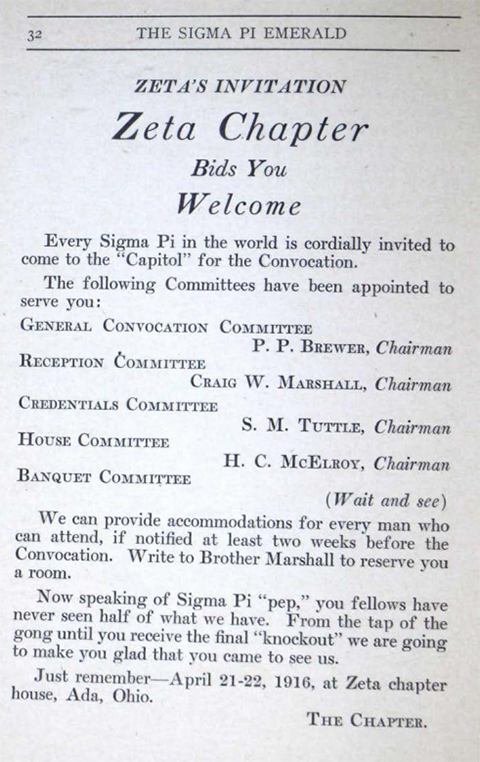 ), but this was not always the case – in the early 1900s, Sigma Pi used Greek letters to name the provinces. BADGE MEN OR CROWD MEN? Sigma Pi does not seek to claim any man who desires to enter our Fraternity that he may merely wear our badge. Such a man if received within our fold would prove undesirable owing to his peculiar make-up. A self-individual within a fraternity is out of his environment and it would require more than a badge to convince him that he was in the right environment. He could not possess that capacity of wanting things for his fellowmen and would never sacrifice his interests or desires that his brothers might be benefited thereby. Occasionally we recognize a fraternity man by his badge, only to conclude much to the discredit of his fraternity that he lacks that requisite quality of a true fraternity man, that of being a good mixer. Though he may have acquired much in wealth or honor he would know little of men and their ways. Anyone desirous for self alone could not be recognized as an authority on men and would never be considered by the world as one of its spokesmen. Sigma Pi is for all of us when all of us cooperate to make it better and bigger. Badge men should not seek to be Sigma Pis. Sigma Pi wants crowd men. As is so often the case with our forefathers in Sigma Pi Fraternity, Brother Bowen writes eloquently about what the Fraternity needs to thrive. He distinguishes between Badge Men and Crowd Men with the primary difference being that Badge Men join a fraternity simply to join. Or, as was common in the 1910s when this was written, some men joined a fraternity just to show off the group’s badge on their chest instead of earning the privilege of wearing that badge everyday that they were honored to be a member. Do you know someone like that in your chapter? Someone who is more concerned about being a “frat guy” than about living a contemporary revival of the storied history behind the letters on his chest? Today, think of the guys who come out for rush just because they want to be a “frat guy” and not necessarily because they want to join something bigger than themselves. These are the opposite of the Crowd Men that Brother Bowen notes in his essay. He says that Crowd Men are those who “have courage for others when they are not interested in what should be our common endeavors.” What does this mean? In today’s terms, Crowd Men are those who are constantly working to improve their local chapter, the larger Greek community, and the plight of collegians across the country. They take an interest in what is important for the Fraternity, but they also see the larger battles taking place across our culture and work to improve the standing of their friends, fraternity brothers, and colleagues in the greater struggle. One of Brother Bowen’s final comments resonated with me in a particular way. He writes, “Sigma Pi is for all of us when all of us cooperate to make it better…” We need more men – young and old alike – who are committed to cooperating to truly making the Fraternity better for all of us, but more importantly – better for the next generation of Sigma Pi men who have yet to join us. This article is cross-posted at TheEmerald.org. Since August 2003, I have proudly volunteered as the local advisor to the Delta-Beta Chapter of Sigma Pi Fraternity at Monmouth University. The role that I fill is called the Chapter Director and I officially held this position for the better part of the last 14 years. There was a two and a half year period where I switched from being the Chapter Director at Monmouth to Sigma Pi Fraternity’s Province Archon for all of New Jersey. The Province Archon is a volunteer advisor and coordinator for a specific geographic region. I held that position from August 2006 through January 2009 and the reason why I resigned from that position might be the focus of a future article here on the blog, but is irrelevant today. At the time that I resigned as the Province Archon for New Jersey, the Delta-Beta Chapter Director position was just vacated by the alumnus who held the position after me, so I was able to easily move back into the Chapter Director position again. I resigned as Chapter Director last August to focus on my obligations as a member of the national board of directors, but I still work with the young men at Monmouth on a daily basis. Before I became the Chapter Director at Monmouth, our Faculty Advisor held the position. Our Faculty Advisor is probably the best, most engaged Faculty Advisor in the entire fraternity (in fact, when Sigma Pi started giving out a #1 Faculty Advisor in the nation award, our advisor was the first recipient). However, when I graduated in 2003, the position was ripe for a new person to hold it. I spent two years as the President of my chapter and during that time I was required to research the many events, reports, and issues that our chapter was completely out of the loop on. Shortly after I graduated, the new President of the chapter and I traveled to Sigma Pi’s leadership school and talked to the fraternity’s Executive Director about our situation. During our trip, I was asked to become the new Chapter Director and we implemented that change immediately. What I learned from my time as an undergraduate leader through my time as a young alumni volunteer and now to someone who has some seasoning as a volunteer is that undergraduates are, naturally, not as connected to the on-going workings of the national organization as one might expect. In other words, national student organizations like fraternities and sororities should not expect every single undergraduate leader at every single undergraduate chapter to take an impassioned interest in the finer points of completing and submitting monthly or quarterly or annual reports. There is going to be an equally less-than-enthusiastic understanding of why it is necessary and beneficial to attend national conferences and regional workshops. It is one of the many jobs of a local and regional volunteer to connect with their undergraduates in an educational, uplifting, and genuine way. The connection must be educational because we need to make the mundane reporting relevant to their everyday experiences as undergraduate leaders. The connection must be uplifting because today’s young men are berated and denigrated by nearly every corner of society just because they are young men. Who will tell our young men, “Good job!” or “I’m proud of you,” if not for us? But most importantly, the connection must be genuine because undergraduates can see through lies and falsehoods with laser-like accuracy. And they should cut through the nonsense! I’ll be writing more about mentoring undergraduates soon, so stay tuned! One of the many fascinating elements of reading past issues of The Emerald is generating a basic idea of the climate within a Sigma Pi chapter during the early years of the fraternity. 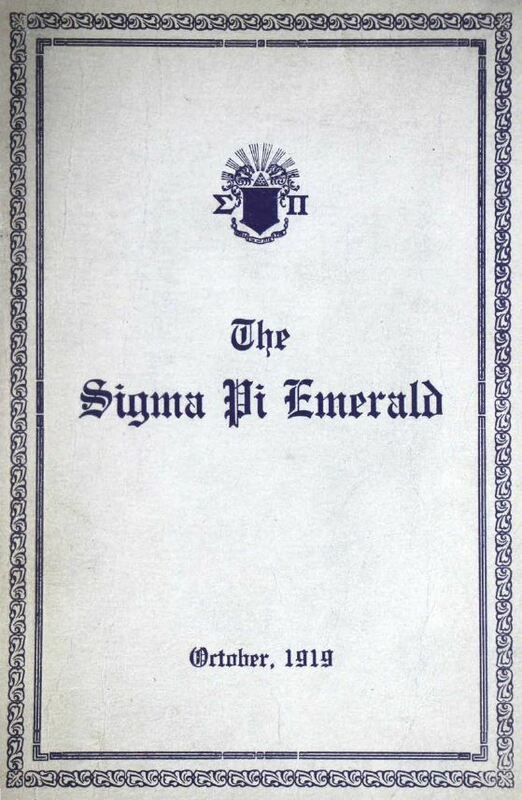 I recently finished reading the January 1916 issue of The Emerald which featured a lengthy update on the Kappa Chapter of Sigma Pi and its history at Temple University in Philadelphia, Pennsylvania. What I liked best about reading this update from the Kappa Chapter is that they told a wonderful story regarding the history of their chapter. And I might add that they told their story in a beautifully written piece where the language was rich and the content was deep. There are no writers today who put pencil to paper (or fingers to keyboard) in as beautiful, meaningful, and precise a language as what I have read in the old issues of The Emerald. Who Should Be Elected to the Grand Council? In this issue as in prior issues, The Emerald lists both the Grand Council as well as something called the Executive Council. It seems to me like the so-called Executive Council is either the group of people who worked for the fraternity at the time or an expanded governing body of volunteers, which we sorely need today. Seven Grand Council members just does not cut it in 2016 – we need more. The brothers at the Kappa Chapter referred to themselves as the “Father of Chapters” because they set up two iterations of the Delta Chapter at the University of Pennsylvania and the Theta Chapter at Penn State University. Back in 1916, there were only 9 active chapters so Kappa Chapter’s claim was pretty legitimate. Who was the First Grand Sage? Throughout their update, the Kappa Chapter talks about so-and-so being elected as the Chancellor of the chapter. Based on what I’ve read, it sounds like the position of Sage used to be called Chancellor. At some point in their update, they mention that Kappa Chapter alumnus M. Atlee Ermold attended Convocation at the end of October 1910. During that Convocation, Ermold was elected as the Grand Sage of the fraternity and was “the first man in Sigma Pi to hold that title.” Interesting. So were Francis L. Lisman and Winford L. Mattoon not the “Grand Sage” but, instead, the National Chancellors of Sigma Pi Fraternity? No Love for the Herald! Incidentally, they refer to the chapter’s Executive Council as the Sage, First Counselor, Second Counselor, Third Counselor, Fourth Counselor, and “fifth member.” No love for the Herald position back in 1916! Kappa Takes a Shot at New Jersey! As a New Jersey guy I have to take issue with Kappa Chapter’s comment that one of the negatives about a recent initiate is that “he hails from Camden, NJ, that barnacle which clings to Philadelphia’s water line.” How dare you?! We didn’t even have any New Jersey chapters back then to defend our good name! That is all that I have for this review of the January 1916 edition of the magazine. If you are interested in this type of stuff, then I encourage you to check out the online archive of The Emerald by clicking here!